Passive Crossings. This type of crossing does not have any type of traffic control device. You must stop at these crossings and follow proper procedures. However, the decision to proceed rests entirely in your hands. Passive crossings require you to recognize the crossing, search for any train using the tracks and decide if there is sufficient clear space to cross safely. Passive crossings have yellow circular advance warning signs, pavement markings and crossbucks to assist you in recognizing a crossing. Advance Warning Signs. 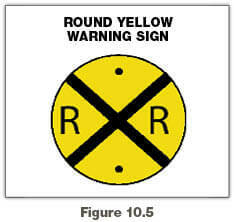 The round, black-on-yellow warning sign is placed ahead of a public railroad-highway crossing. The advance warning sign tells you to slow down, look and listen for the train, and be prepared to stop at the tracks if a train is coming. See Figure 10.5. Pavement Markings. Pavement markings mean the same as the advance warning sign. 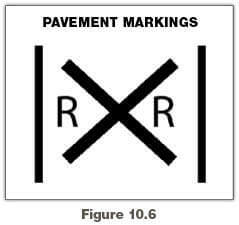 They consist of an “X” with the letters “”RR” and a no-passing marking on two-lane roads. There is also a no passing zone sign on two-lane roads. There may be a white stop line painted on the pavement before the railroad tracks. The front of the school bus must remain behind this line while stopped at the crossing. See Figure 10.6. Crossbuck Signs. This sign marks the crossing. It requires you to yield the right-of-way to the train. If there is no white line painted on the pavement, you must stop the bus before the crossbuck sign. 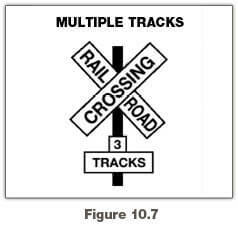 When the road crosses over more than one set of tracks, a sign below the crossbuck indicates the number of tracks. See Figure 10.7. Flashing Red Light Signals. At many highway-rail grade crossings, the crossbuck sign has flashing red lights and bells. When the lights begin to flash, stop! A train is approaching. You are required to yield the right-of-way to the train. If there is more than one track, make sure all tracks are clear before crossing. See Figure 10.8. Gates. Many railroad-highway crossings have gates with flashing red lights and bells. Stop when the lights begin to flash and before the gate lowers across the road lane. Remain stopped until the gates go up and the lights have stopped flashing. Proceed when it is safe. 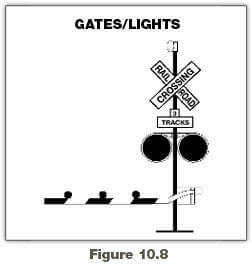 If the gate stays down after the train passes, do not drive around the gate. Instead, call your dispatcher. See Figure 10.8. Each state has laws and regulations governing how school buses must operate at railroad-highway crossings. It is important for you to understand and obey these state laws and regulations. In general, school buses must stop at all crossings, and ensure it is safe before proceeding across the tracks. The specific procedures required in each state vary. A school bus is one of the safest vehicles on the highway. However, a school bus does not have the slightest edge when involved in a crash with a train. Because of a train’s size and weight it cannot stop quickly. An emergency escape route does not exist for a train. You can prevent school bus/train crashes by following these recommended procedures. Place the transmission in Park, or if there is no Park shift point, in Neutral and press down on the service brake or set the parking brakes. Turn off all radios and noisy equipment, and silence the passengers. If the gate comes down after you have started across, drive through it even if it means you will break the gate. Bus Stalls or Trapped on Tracks. If your bus stalls or is trapped on the tracks, get everyone out and off the tracks immediately. Move everyone far from the bus at an angle, which is both away from the tracks and toward the train. Police Officer at the Crossing. If a police officer is at the crossing, obey directions. If there is no police officer, and you believe the signal is malfunctioning, call your dispatcher to report the situation and ask for instructions on how to proceed. Obstructed View of Tracks. Plan your route so it provides maximum sight distance at highway-rail grade crossings. Do not attempt to cross the tracks unless you can see far enough down the track to know for certain that no trains are approaching. Passive crossings are those that do not have any type of traffic control device. Be especially careful at “passive” crossings. Even if there are active railroad signals that indicate the tracks are clear, you must look and listen to be sure it is safe to proceed. Containment or Storage Areas. If it won’t fit, don’t commit! Know the length of your bus and the size of the containment area at highway-rail crossings on the school bus route, as well as any crossing you encounter in the course of a school activity trip. When approaching a crossing with a signal or stop sign on the opposite side, pay attention to the amount of room there. Be certain the bus has enough containment or storage area to completely clear the railroad tracks on the other side if there is a need to stop. As a general rule, add 15 feet to the length of the school bus to determine an acceptable amount of containment or storage area.